1 What is glyphosate and why should I be concerned? Glyphosate is the active principle of the main herbicides used in agriculture. Since 1974 in the U.S., over 1.6 billion kilograms of glyphosate active ingredient have been used or 19% of estimated global use of glyphosate (8.6 billion kilograms). Globally, glyphosate use has risen almost 15-fold since so-called “Roundup Ready,” genetically engineered glyphosate-tolerant crops were introduced in 1996. a US EPA report of 2011 estimates world pesticide amount used in 2006 and 2007 to be approximately 5.2 billion pounds. According to Enserink et al. 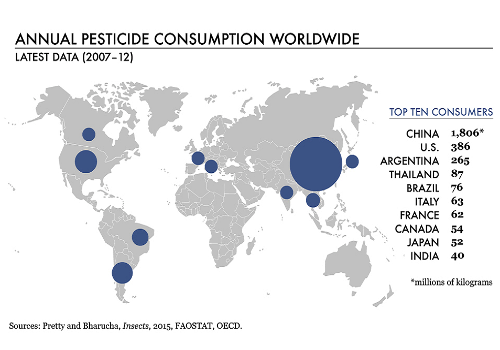 study of 2013, Europe is the world’s largest pesticide consumer. 2 Herbicides are used on the crop stage to target weeds and they don’t affect our food. Is it correct? 3 How much does glyphosate affect our food, our environment, our health? The latest UN Special Rapporteur for the Right to Food points to research showing that pesticides are responsible for an estimated 200,000 acute poisoning deaths each year. It’s presence in food for human consumption and animal feed is ubiquitous. Epidemiological studies have revealed a strong correlation between the increasing incidence of a large number of chronic diseases. These substances act as endocrine disruptors. Prolonged exposure is related to the occurrence of cancer – in particular Non-Hodgkin Lymphoma, Alzheimer’s, Parkinson’s, kidney and liver diseases, hormonal disorders, growth and learning problems in infants and children, male and female infertility, genotoxicity, including neurological disorders such as memory loss, visual impairment and/or motor coordination, loss of balance, dizziness. Other possible effects arising from exposure are the onset of asthma and allergies. Farmers, agricultural workers, communities living near plantations, indigenous communities, pregnant women and children are particularly vulnerable to pesticide exposure. In a recent case sick Employees of Transgenic Companies Report their Cases to the Government of Puerto Rico. Roundup’s Toxic Chemical Glyphosate was found in 100% of California Wines Tested. Glyphosate usage is widespread that it is now showing up even in foods that haven’t been directly sprayed, namely the grapes used to make organic wine. In 2016 in Germany, traces of glyphosate was found in 14 of the most widely popular brands of beer, with levels ranging from 0.46 to 29, 74 microgram per liter. 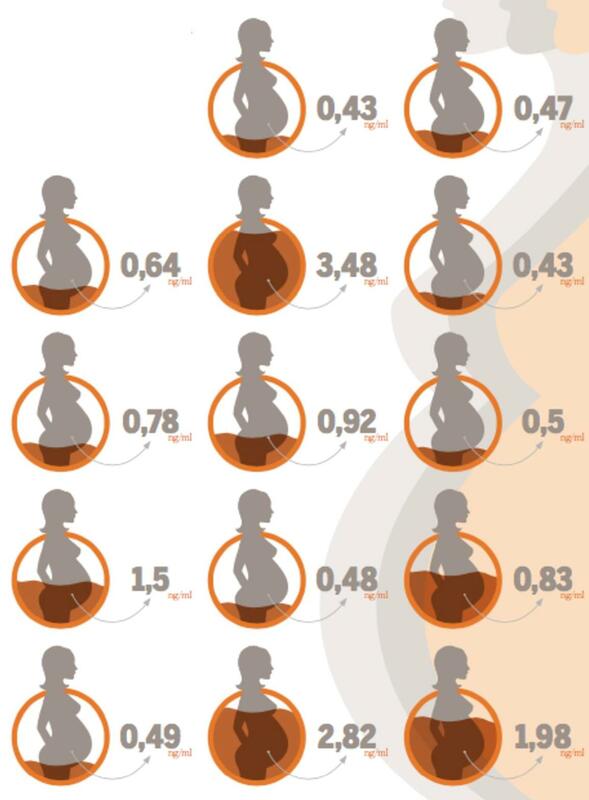 14 pregnant women in Italy were tested positive for glyphosate in urine, despite their being very careful on the quality of the food they ate. Glyphosate was detected in 44% of the 180 urine samples taken from European citizens in 18 countries. Glyphosate traces were found in the urine of 48 MEPs from 13 different EU countries voluntarily participating in a popular test. 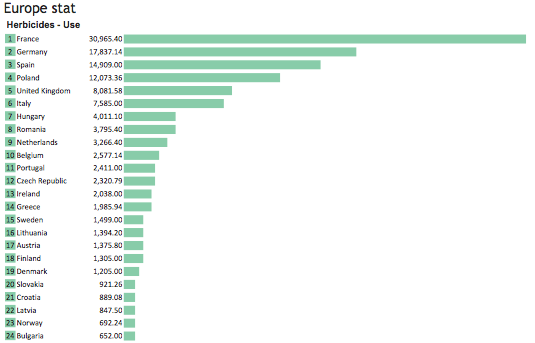 All the traces were 17 times higher than the EU drinking water norm (0.1 microgram/litre). 4 But isn’t the quantity of these chemicals spread in the environment under the legally determined safe levels ? As Andre Leu, President of IFOAM, in the “Myth of Safe Pesticides” states: “Until the use of pesticides is regulated on the basis of current, published, peer reviewed science, there is no scientific basis on which to base the belief that the residue levels in our food and environment are safe”. studies by scientific researchers have raised the issue of agricultural chemicals as significant contributors to negative global environmental change and adverse human health due to persistent and short term environmental toxicants. The body of science showing that agricultural chemicals are responsible for declines in biodiversity along with environmental and health problems continues to grow. Video: El costo humano de los agrotóxicos – por Pablo Ernesto Piovano (Subtitulado: inglés) from Pablo Ernesto Piovano on Vimeo. 5 Pesticides are indeed dangerous but are they needed to increase production in order to feed the world? Globally, small farms produce 70% of the food we eat using 25% of the land, while industrial farms – according to the FAO International Technical Conference on Plant Genetic Resources in Leipzig (1995) – produce only 30% food, using 75% of the land, destroying 75% of the soil, water, biodiversity, while emitting 50% of the Green house gases that are polluting the atmosphere and destabilising the climate system. Industrial agriculture produces commodities, not food. 90% of corn and soya grown in the world go for Biofuel and animal feed. The costs of production in chemical, industrial agriculture systems is higher than the value of the output. Without giant subsidies they cannot survive. All the scientific evidence is showing that small farms are more productive than large farms. Navdanya’s report on Biodiversity Based Productivity and Health per Acre shows that small biodiverse farms produce more food and more nutrition than chemical monocultures. 6 What about regulations? Can the European precautionary principle be used to protect consumers and workers? The application of the precautionary principle is hampered by both lack of political will,[ as well as the wide range of interpretations placed on it. One study identified 14 different formulations of the principle in treaties and nontreaty declarations. One of the difficulties of the application of the principle in modern policy-making is that there is often an irreducible conflict between different interests, so that the debate necessarily involves politics. In a recent study “Towards a better pesticide policy for the European Union”, scientists argue the weaknesses of the current pesticide environmental risk assessment procedures. Pesticide policy is heavily criticized for being relatively inefficient. For example, a pesticide ban does not necessarily mean that the pesticide is totally off the market. According to Pesticides Action Network, exceptional authorizations for special uses of banned pesticides have increased five-fold within four years (2006-2010). With 74 banned pesticides getting exceptional authorization for special uses, France was nominated the ‘European backdoor champion’ in 2010 – followed by Greece (54), Portugal (31), and Germany (24). All over Europe, the level of pesticide contamination has not substantially diminished despite the efforts of different Member States to reach the objectives of relevant directives like the EU-Water Framework Directive 2000/60/EC and of the EU-Directive 2009/128/ EC for sustainable use of pesticides. Unfortunately also the post-authorization evaluation of pesticide impacts is weak. 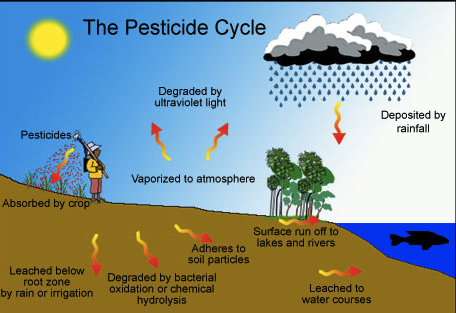 This is particularly the case for the description of pesticide degradation processes in soils. This point of view is shared by the European Environment Agency (EEA) that, on the basis of historical case studies, underlines that early warnings were ignored or sidelined until damage to health and the environment was inevitable. 7 So we cannot trust 100% the work of regulation agencies? Institutional risk assessment procedures are highly criticized by independent scientists as most of the times evaluations are based on the single active principle, without considering the so-called “cocktail effect”. The definition of “safe level” is controversial. Several independent studies underline the fact that exposure can be episodic but repetitive and to more than one substance at the same time. Moreover the work of regulatory agencies has to be constantly reviewed as there is a strong risk of conflict of interest. For example, industry-funded research has long found RoundUp (glyphosate based Monsanto’s flagship product) to be relatively safe. A case in federal court in San Francisco challenged that conclusion, building on the findings of the International Agency for Research on Cancer (IARC) of the World Health Organization (WHO) which declared it “Probably carcinogenic to humans”. Court documents included Monsanto’s internal emails between the company and the Environmental Protection Agency (EPA) Records suggested that Monsanto had ghostwritten research that was later attributed to academics and indicated that an EPA senior official had worked to quash a review of glyphosate. It also became clear that Monsanto was aware of the genotoxicity of glyphosate since 1984. 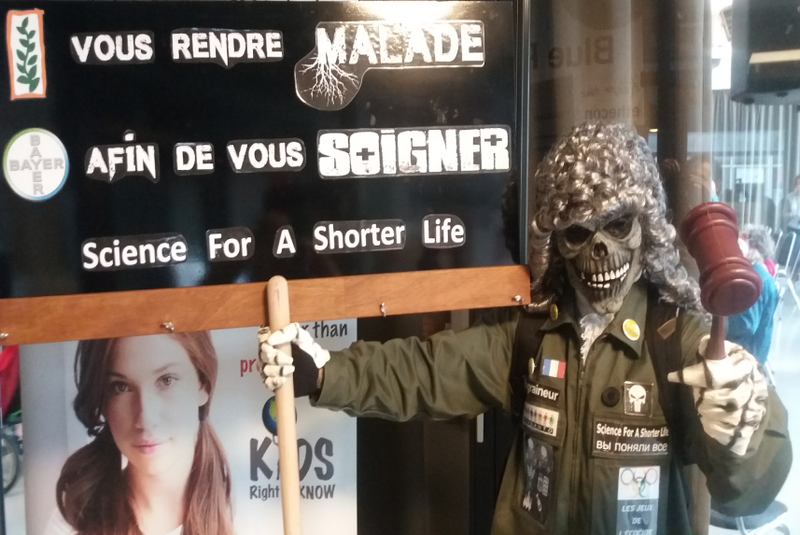 Monsanto’s “War on Science” has been exposed in an extensive investigation published by Le Monde. In Europe the glyphosate risk assessments released by the European Food Safety Authority (EFSA) and the European Chemical Agency (ECHA), which declared that glyphosate is not a human carcinogen, have been heavily criticised by independent scientists, lawyers and NGOs. According to an investigation by Corporate Europe Observatory “almost 60 percent of EFSA’s experts had direct and/or indirect financial interests with companies whose products the Authority was assessing” in 2013. In response to the revelations that emerged in the “Monsanto Papers”, a cross-party group of MEPs expressed their concern to the EU commission about the studies being used in the EU assessment of the safety of glyphosate and requested a thorough investigation into these revelations. In September 2017, Monsanto lobbyists were banned from entering the European parliament after the multinational refused to attend a parliamentary hearing into allegations of regulatory interference. In October 2017, an ENVI / AGRI committees debate shed even more light on the actual concerns about loopholes, conflicts of interest, corporate interference and pressure, as well as gave a very clear picture of corporate strategic efforts to control, manipulate, and deceive, which have characterised the risk assessment analysis that led to the 18 months exemption of glyphosate authorisation in Europe in 2016. The recent UN Special Report by the Special Rapporteur on the Right to Food, Hilal Elver, asserted that competent authorities must pay closer attention to the pressures of the agrochemical industry, in both the scientific and institutional fields. 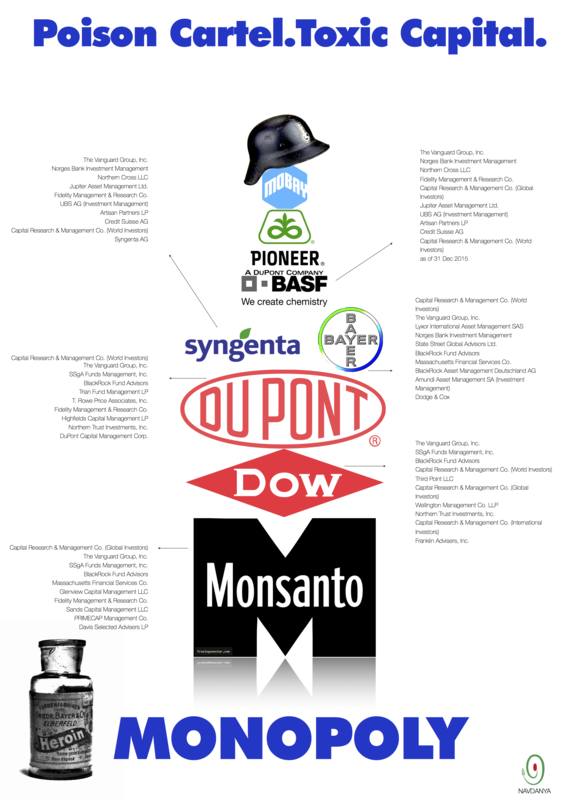 8 Which corporations are ruling the pesticides market? The pesticides market is controlled by a handful of agrichemical corporations: Bayer CropScience, Monsanto, BASF, Syngenta, ChemChina, Dow AgroSciences and DuPont, which are aiming at decreasing in number through mergers, such as Dow Chemical – which bought up Union Carbide responsible for the Bhopal disaster killing over 20,000 people – now merging with Dupont (130 billion dollar deal), Syngenta merging with ChemChina (43 billion dollar deal), and Bayer merging with Monsanto (57 billion dollar deal). The European Commission has recently opened an in-depth investigation to assess the proposed acquisition of Monsanto by Bayer under the EU Merger Regulation. The Commission has concerns that the merger may reduce competition in areas such as pesticides, seeds and traits and has until 8 January 2018, to take a decision. These mergers would exacerbate the problems caused by industrial farming – with still further negative consequences for the public, farmers and farm workers, consumers, the environment, and food security. Should all these mergers be approved by EU and US regulators, just three companies will be left in control of 60 per cent of the world’s seeds and 70 per cent of its chemicals and pesticides. This concentration of power represents a “Poison Cartel” in a market based on “Toxic Capital” where business giants put pressure on governments and institutions to undermine any regulation aimed at protecting people’s health and the environment, and that would affect their profits. 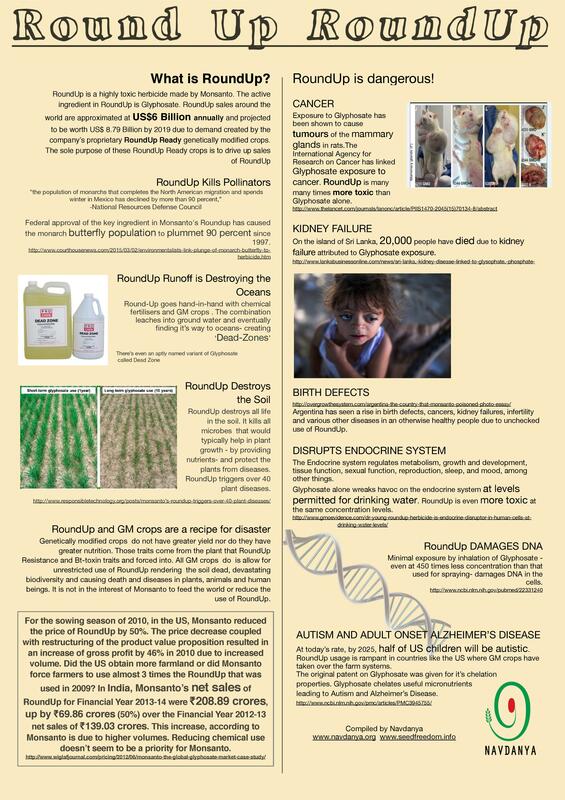 In September 2017 Navdanya launched the Report “TheToxic Story of RoundUp: Freedom from the Poison Cartel through Agroecology”, which describes the origins and growth of the Poison Cartel and the ways in which these giant agri-business companies gain and keep control of their empires, among other things, in collusion with governmental agencies. 9 What can civil society do to make governments and corporations accountable ? 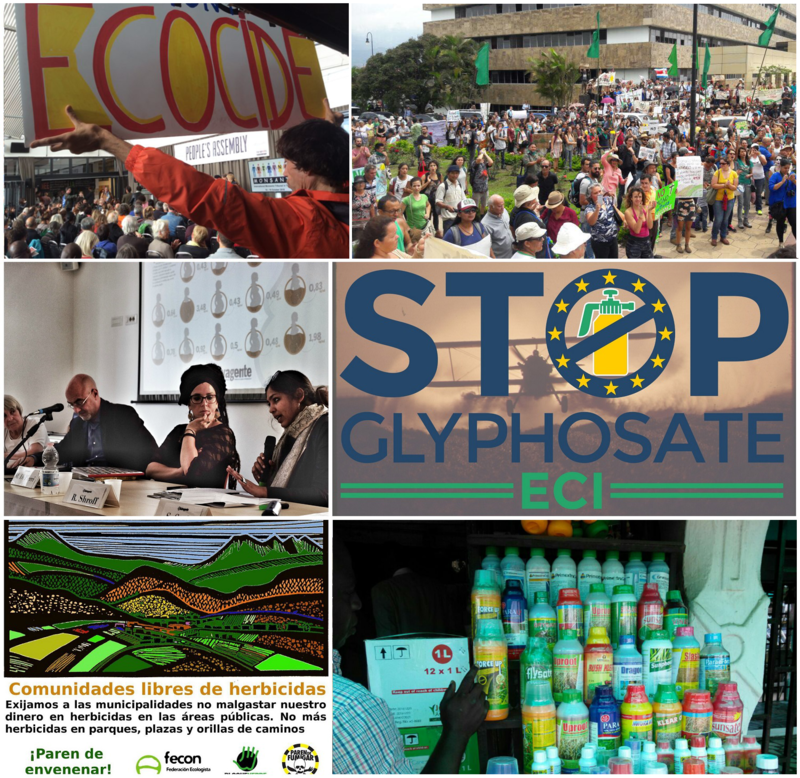 Worldwide, civil society is mobilizing against the use of agrotoxic agents promoted by the Poison Cartel. One such major international mobilization was the holding of a people’s tribunal, the Monsanto Tribunal in the Hague where witnesses, experts and lawyers denounced environmental and social damages directly caused by Monsanto, especially in relation to the impact of glyphosate based Round-Up on health and the environment. The Advisory Legal Opinion of the Judges, issued on 18 April 2017, confirmed that Monsanto’s activities undermine basic human rights, victims of multinational corporations need better protective regulations and international courts should recognize ecocide as a crime. – In Europe, citizens have used a relatively recent democracy tool: the ECI – European Citizens Initiative, which allows a formal invitation to the European Commission to submit a legislative act in one of the areas of EU competence. In less than five months, more than one million EU citizens have joined the ECI to revoke the authorization of glyphosate use in all member states and to reform procedures for the approval of pesticides in Europe. This is not a “binding” instrument, but the European Commission is obliged to respond and thus also to give political insight to the subject. – Movements across the world are taking action in order to protect health and environment against the policies and violence of the Poison Cartel. In 2014 Sri Lanka was the first state that banned glyphosate after the publication of one study on the correlation between the use of pesticides based glyphosate and Chronic Interstitial Nephritis in Agricultural Communities-CINAC. In 2013 also El Salvador approved the amendment of a Law which allows the prohibition of 53 chemicals, including Paraquat, Glyphosate and Endosulfan. Environmental and scientific movements across Costa Rica are nowadays mobilizing a national campaign to “detoxify” communities and public places which are leading to many herbicides-free zones.